This image is from the "Salome" art piece by Alfons Mucha. 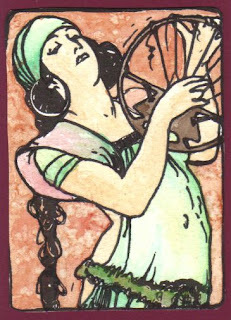 The card was done for The Mucha Challenge swap by The Red Cat. Limited Edition of only 10 cards each card is watercolored by hand. The image didn't stamp well on watercolor paper so I had to fill in the lines of the image to get a crisp image... but I am glad I used the watercolor paper. The vivid translucent watercolors make the card my favorite. I regret that I don't ave any extras this time. The last three swaps I was in found me pressed for time so I only did enough for the swap (or a round number close to it). These were very difficult and then I took a lot of time in the watercolor. I wish I had more to trade and share because they may be my most beautiful card ever. The colors are very translucent and much more vivid than the scanned image here on the blog. You have been nominated for the Lemonade Stand Blog Award! You can pick it up at my blog later tonight or tomorrow.